For nitwits are we all. 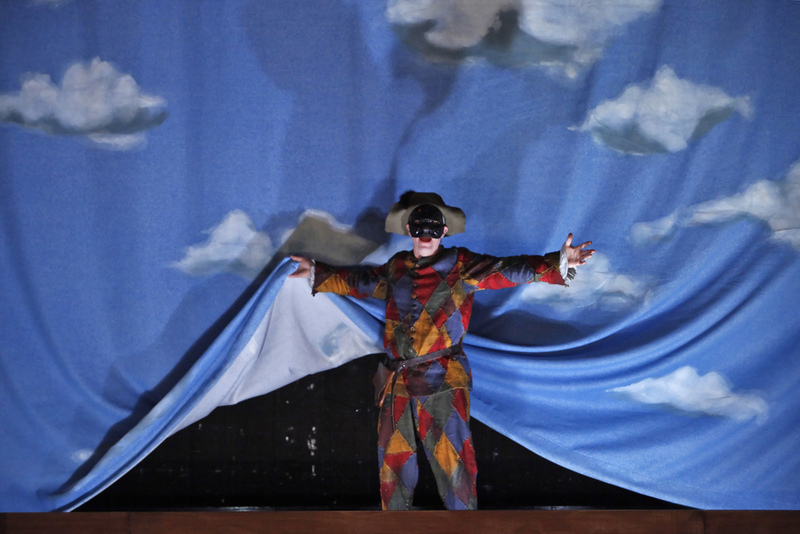 Thus the opening song, sung by the raucous cast of Carlo Goldoni’s commedia dell’arte masterpiece, The Servant of Two Masters, adapted by Constance Congdon, now playing at the Yale Rep. The song is an invitation to a celebration of silliness, slapstick, stupidity, and, yes, sincerity -- for true love carries the day on all levels. En route to betrothed bliss are mistaken identities, disguises, love-lorn histrionics, jealousies, subterfuge, foolery involving food and letters and trunks, banter and sexual innuendo, lovely tableaux, and graceful, lyrical song. What’s not to like? It’s a play anyone can enjoy, bursting with vitality and love of stagecraft in all its crowd-pleasing showiness. The costumes (by Valérie Thérèse Bart) are gorgeous, the use of space, backdrops, and props playful, the timing precise, the comic bits keep coming, and the gears keep shifting. Just when you think the play is about to settle into a predictable series of convolutions to keep the right innamorati from getting together, something unexpected comes along -- like fish and pots being flung toward the audience to be doggedly snatched from the air by the intrepid Truffaldino, a buffoon in motley, who tries to serve two masters in hopes of doubling his meal ticket. And when you think, by Intermission, you’ve seen all Steve Epp has to offer in the role, guess again. In the second half, his dialogue with one master -- the preening, effete Florindo (Jesse J. Perez in a role that takes playing ‘broad’ to new lengths and heights) -- becomes an astounding series of non sequiturs and verbal pratfalls. And it’s then that Truffaldino, who has been winking at the audience throughout in asides, seems to become the naively inspired master of ceremonies in a plot that exposes the foolishness undergone in the name of love, pride, hunger, but that also lets us all off the hook. Nitwits we may be, but we know a happy ending when it’s coming. Particularly memorable, besides Epp and Perez, are Allen Gilmore as Pantalone, father of the bride, a cartoon come to life, with a voice modulating all over the scale, from full-throated rage to unctuous glissandos; and Da’Vine Joy Randolph, of the Yale School of Drama, as his daughter -- petulant, heart-felt, sassy, with but a heartbeat separating her moods. Her duet of longing with her maid Smeraldina (Liz Wisan, also of YSD), smitten by Truffaldino, offers lyric relief from all the comedy, and the sensible Smeraldina gets to deliver with gusto the somewhat dated imprecations about a sexual double standard: how women are held up to scorn for infidelity, while no one says a word about male trespasses (sure, sure, tell that to Tiger Woods). But, lest you think this show has nothing to say to our modern sensibilities, check out the menu duet -- in which Truffaldino and the master cook Brighella (Liam Craig) ponder a five course dinner with evocative gestures and sound effects for each creature slaughtered for the feast. In many such moments, director Chris Bayes, Head of Physical Acting at YSD, demonstrates what is meant by that term: the choreography of repetitive gestures, reactions, and vocal registers create a comic thread that runs through the play’s various encounters, making the characters themselves, ably abetted by the trio of musicians on stage, seem part of a vast musical composition, a comic folk opera that recalls the antics of the Marx Brothers, the early Woody Allen, and any good comedy duo or troupe you’d care to name.